FINALLY I have been able to get a table at Mamak. I’m not talking about waiting a few minutes – I’m talking a couple of years. For the past two years every time I have walked past this Malaysian eatery in Sydney’s Goulburn Street there has been a queue of people waiting to get in. I have never joined the line but, like those who were waiting, I was entertained and intrigued by the roti chef behind the huge window kneading, pulling, stretching and folding dough with seamless effort (and sometimes stuffing it), and cooking the parcel on a gleaming stainless steel hotplate. So, am I a queue jumper? Admittedly, I got in because I arrived at noon before the main lunch crowd but even at that time people were starting to come through the doors (it’s all about the timing). Mamak is a Malaysian term describing the country’s Indian Tamil community and culture and Mamak (the restaurant) offers Indian-inspired street-eats that can be found at the street stalls (or mapley) of Kuala Lumpur. The restaurant is narrow, noisy and cramped. Large photographs of chefs at work with flaming woks or stretching roti (and other restaurant scenes), hang on a feature red wall on one side of the room. Attentive and young staff dressed in black t-shirts and wearing colourful Crocs effortlessly glide through their tight surrounds and amongst dark laminated tables filling fast with diners. There is a distinctive buzz about the place. 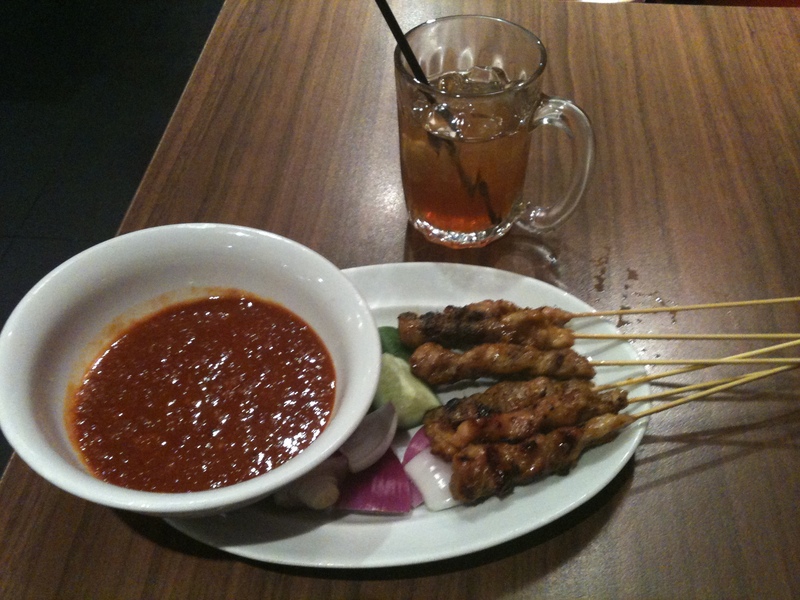 As I was dining alone I opted for a serve of six chicken satays ($8), a lamb murtabak ($10.50) and a glass of teh ‘o’ ais limau – lime iced tea ($3.50). The satay had been char-grilled over coals and consisted of strips of scewered chicken lightly marinated in a blend of spices (and possibly coconut cream). It was accompanied by a bowl of spicy and creamy peanut sauce and wedges of red onion and cucumber. The aroma and taste of the dish brought back to me memories of the old “Satay Club” in Singapore. The murtabak (roti) was a beautiful and plump golden square of flaky, thin yet firm pastry filled with a spicy blend (almost omelette like) of minced lamb, egg, onion and cabbage. It was served on a stainless steel platter with two curry dips and a dollop of sambal (chilli paste). The pastry was light and fluffy and perfect but I expected the filling to be more drier and ‘meatier’ and not to be typical of an omelette. The iced lime tea was the perfect quencher – a combination of tea and sweetened fresh lime juice which was able to cut through the fatty creaminess of the satay sauce and the murtabak’s pastry. It was the ideal palate refresher. Mamak is renowned for its roti (there is a collection of sweet and savoury on offer) but it also has an array of other Malaysian food available. Diners can order Malaysian street delights like kari ayam (chicken curry), ayam goreng (fried chicken), and the famous Malaysian rojak – a salad of prawn and coconut fritters, beans, cucumber and other vegetables topped with peanut sauce. The restaurant is fast, funky and great value. 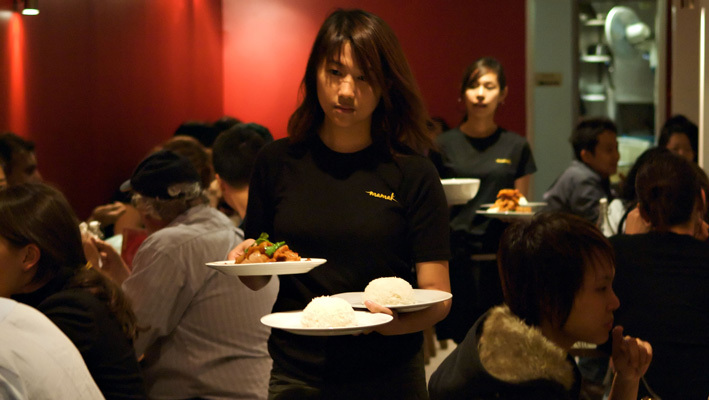 Mamak’s staff are attentive and the food come out fast – just as it would if you were on the streets of KL. It isn’t one of those places you hang around in (but if you have to hang around in its line you will be well rewarded). Despite only sampling a trickle of what is on offer at Mamak I plan to head back in the near future with friends so I can get a better appreciation of this restaurant and will report back what I experience. The verdict: Am I on the streets of Sydney or KL? Incredibly authentic, spicy and delightful – possibly the best roti outside of Malaysia. Great value and well worth lining up for. Ate there: 15 June 2010. This entry was posted in Malaysian, New South Wales, Sydney and tagged Australia, Food, Malaysian, Mamak, street food, Sydney. Bookmark the permalink. 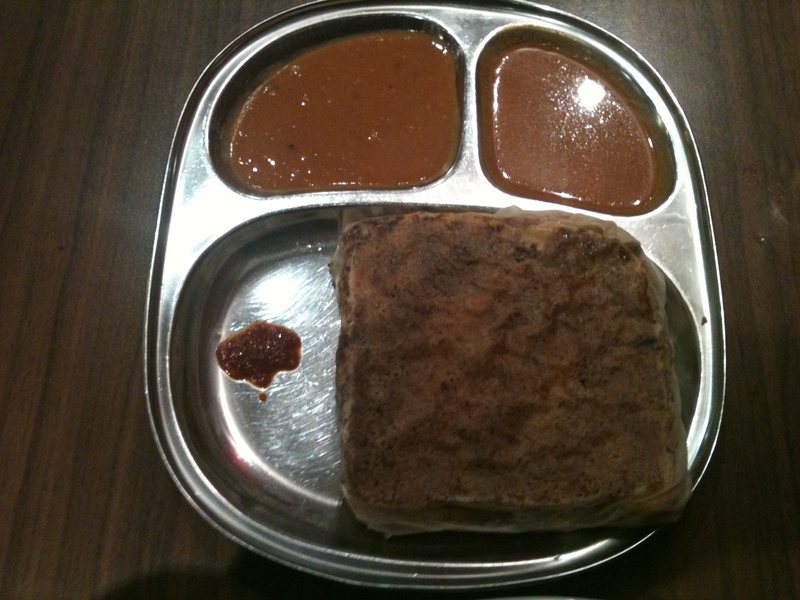 My favourite Malaysian place in Sydney – worthwhile standing in queue… and what about those roti tissues, YUM! Roti Canai is the must-try dish. 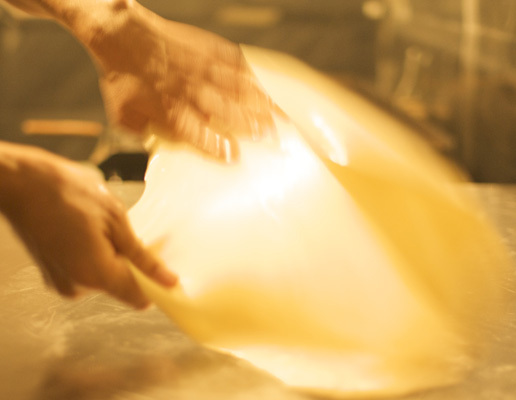 The roti is plated all roughed-up. Tear it up and dip in the dipping sauce. If you want something different (but tasty) order a Rojak. A crazy prawn cracker salad. But whatever you order save room for the cone-shaped Roti Tissu. Skip the ice-cream and have it plain so to appreciate its sweet crunchiness. (The alternative to a side-serve of icecream is a side-serve of curry. That’s how authentic this place is). Mamak was on my must-do list on a recent visit to Sydney. I thought I’d get in early – the place opens at 5.30pm but already at 5pm on a Monday night the queue starts to form – I got in line at about 5.20pm and when the doors opened I was lucky enough to get the last table. Whew! As I already had plans for dinner that night, this was just a visit to taste the Roti and grab a drink, and I wasn’t disappointed. The Roti Canai was sensational and was washed down with the best damn lime iced tea I’ve ever had. Next time, if I can get in again, I’ll definitely make a full meal of it – satays, curry and all.